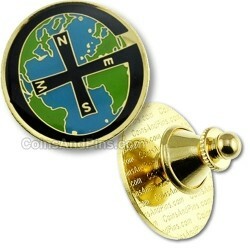 The Gx World Pin is great for showing your support for geocaching. Ever been caching, seen other people around the cache area, and wondered if they were cachers as well? This pin was created to help people identify themselves discretely to other cachers. It can be worn on shirts, jackets, hats, and more. It is plated in 24K gold, epoxy coated, and has an easy to use, durable clip. The pin measures 20mm in diameter (1mm larger than a penny).